Concentrative movement therapy (CMT) focuses on the awareness and expression of body sensations for clients from a wide range of mental illnesses. Based on psychodynamic therapy, CMT uses sensory motor body experience and symbolization of inner processes by CMT-objects, postures or words. The purpose is to evoke emotions to understand the psychological meaning of body symptoms, which can be symbolic expressions of childhood or actual conflicts. CMT is applied as individual and group therapy in outpatient and inpatient settings for the treatment of psychosomatic and psychic diseases. Evidence has shown this approach to be especially helpful for inpatient clients with psychosomatic and psychic disorders. It is common in the health care system of Germany and Austria. CMT was developed during the mid-1950s by Helmuth Stolze, a psychoanalyst working in Munich, Germany. Its roots go back to the early 1920s to the gymnastic work of Elsa Gindler in Berlin, Germany. She developed the concept of sensory awareness, both in rest and motion, using movement for self-discovery and inner experience development. CMT has spread throughout Germany and Austria, and is most often used in inpatient group psychotherapy with multiprofessional teams. It was further developed by Christine Gräff, movement therapist from Munich, Germany. Since 1975, a training program of the German Association of CMT (Deutscher Arbeitskreis für Konzentrative Bewegungstherapie e.V., or DAKBT) sets standards for CMT training. The national CMT associations of Germany, Switzerland, Austria, Slowakia, Belgium and Italy form the European Association of CMT (Europäischer Arbeitskreis für Konzentrative Bewegungstherapie, or EAKBT), using standards similar to those of the German association. In Austria CMT is one of the scientific based, officially recognized, psychotherapies. CMT works with the body image, that is, the subconscious frame of meaning of movement, body sensations, and emotions. Mind and brain research of the past decade has shown the importance of the body in psychotherapy, and CMT has shown evidence of its usefulness with clients experiencing neurotic and psychosomatic disorders. Recently, the approach has been expanded for use with clients suffering from traumatic experiences. CMT therapy focuses on body perception, body experience, and movement expression. A central treatment element is the use of the “CMT-offer,” by which clients become aware of their perceptions while they are moving. CMT therapists develop this offer based on (bodily) countertransference, or their awareness of feelings toward the client or the group. The therapists make the offer based on their “movement interpretation” of the current therapeutic situation. The clients react with “free movement association” (analogous to the psychoanalytic “free association”). In concentrative moving and acting, clients realize their feelings and may remember old movement and communication patterns that are inscribed in body-memory. According to CMT, unresolved or unconscious life events are stored in the body-memory. These “embodied experiences” emerge in the therapeutic situation and are integrated into therapy by nonverbal symbolization and verbalization in the therapeutic dialogue. Following this step, the client may experiment with new behaviors in movement or posture. A number of concepts related to psychodynamic and humanistic theory are used in CMT. Major concepts include body image; connection of movement, perception, thinking and acting; space to experience and space to reflect; and contact. Body image is a construct for the inner representation of the physical and psychological self. It is not fixed but depends on experiences in relationships, including body schema, body self, body fantasy, and body concept. By listening to the body, those unconscious aspects can become conscious for therapists and their clients. CMT works with the connection between movement and perception on one hand; thinking and acting on the other hand. In CMT, the process of change can be initiated by moving, perceiving, acting, or thinking. CMT divides the therapeutic session into an experience space and a reflecting space. In the first part, clients are allowed to behave freely, like a playing child. In the second part, the clients and therapists develop an understanding of what has happened and interpret the actions based on the clients’ biography or the group interaction. Physical contact, or touching, is a useful tool of CMT. When a person is a young child, been touched is necessary to establish the own physical boundaries and define oneself as being different from others. Sometimes clients suffer from too much touching (abuse) or too little touching (neglect). Touching CMT-objects, like balls or stones, helps clients to develop their own sense of tactition. For example, clients realize by gently touching their own hand that touch does not need to be painful or against their will (as in former times) and that they have control with regard to intensity and character of touch. Being touched by the therapist or group members can change old patterns of anxiety or withdrawal and can give comfort. Now the client can feel that a gentle hand on her or his shoulder is caring and sheltering. CMT therapists apply different tools at the need of the clients. The tools include concentrative sensing and movement, working with CMT-objects, play, and body dialogue. Concentrative sensing and movement is the process whereby clients become aware of their body sensations and therapists learn nonverbal information about the clients’ problems. Using CMT-objects (like ball, bar, stone, small sandbag, rug, rope) helps clients differentiate their sensory perception and gives opportunities to symbolize their conflicts or traumas without words. Objects help a client come into contact with others or to establish a border between oneself and others. Clients, who were neglected or suppressed in early childhood, often did not have the opportunity to play. Donald Winicott described how important play is for the development of children’s creativity. He called the realm of playing “transition space,” a space of fantasy between outer and inner world. CMT-Offers can be seen as an invitation to establish this transition space in therapy. Clients are invited to play with CMT-objects or with the group members. Playing, that is acting guided by the unconscious instead of the conscious mind. The new experience of playfulness is integrated into positive memory. Unconscious movements regulate the dialogue with others. In CMT, this body dialogue is made conscious by awareness. New ways to regulate distance and closeness are explored. For example, a client who has realized that she always had neglected her body perception—she came too close to others and was hurt by the other’s rejection—now uses her bodily sensations to keep a comfortable distance to others. Another client who presented himself grimly in the CMT-group discovered that he tried to protect himself from the anger of others but provoked anger and rejection by his behavior. With awareness, he now experiences the approach of other group members to be friendly and not harmful and learns to trust others and himself. CMT takes 40 sessions on average; however, it can range from 5 to 300 sessions. Inpatient group therapies take 5 to 10 weeks (10 to 20 sessions). Early sessions focus on creating a good therapeutic alliance and the teaching of concentrative sensing. In further sessions, old dysfunctional patterns in movement and behavior appear; inner- and interpersonal conflicts emerge and the body-oriented approach is used to understand them. In the second half of treatment, new movement patterns are explored and repeated. New solutions are found by body awareness and contact with the therapist or with other group members and conflicts can be resolved. In the final sessions, separation and farewell is experienced with body and mind. Hamacher-Erbguth, A. (Ed.) (2012/2013). Concentrative Movement Therapy CMT (KBT). An evaluated Body Psychotherapy for psychosomatic and psychic disorders. European Psychotherapy 11. CIP-Medien. With articles from: Anemone Carl, Heide Häcker, Jürgen Schultheiß, Helga Hofinger, Anton Szugfil, Ulrike Schmitz, Christine Breitenborn, Elisabeth Oedl-Kletter, Klaus-Peter Seidler. Schreiber-Willnow, K. (2000). The body and self experience grid in clinical Concentrative Movement Therapy (CMT). In: J. W. Scheer (Ed. ), The person in society: Challenges to a constructivist theory (pp. 317-327). Gießen, DE: Psychosozial. Schreiber-Willnow, K., Seidler, K.-P. (2013). Therapy goals and treatment results in body psychotherapy: Experience with the Concentrative Movement Therapy evaluation form. Body, Movement and Dance in Psychotherapy, 8, 255-270. Seidler, K.-P., Schreiber-Willnow, K. (2004). 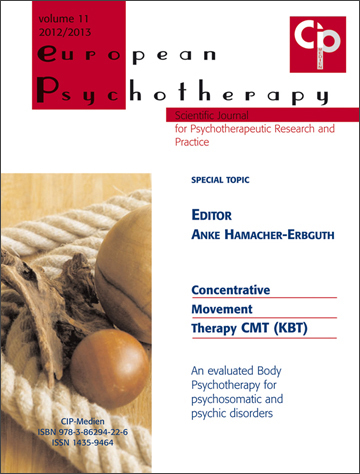 Concentrative Movement Therapy as body-oriented psychotherapy for inpatients with different body experience. Psychotherapy Research, 14, 378-367. Stolze, H. (1983). Concentrative Movement Therapy. Sensory awareness bulletin: The work after Elsa Gindler, 11, 9-15.